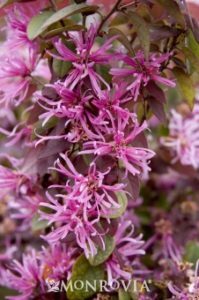 ‘Sizzling Pink’ Chinese Loropetalum is the focal point plant for a Willamette Heights Landscape Design in a Day client’s entry. 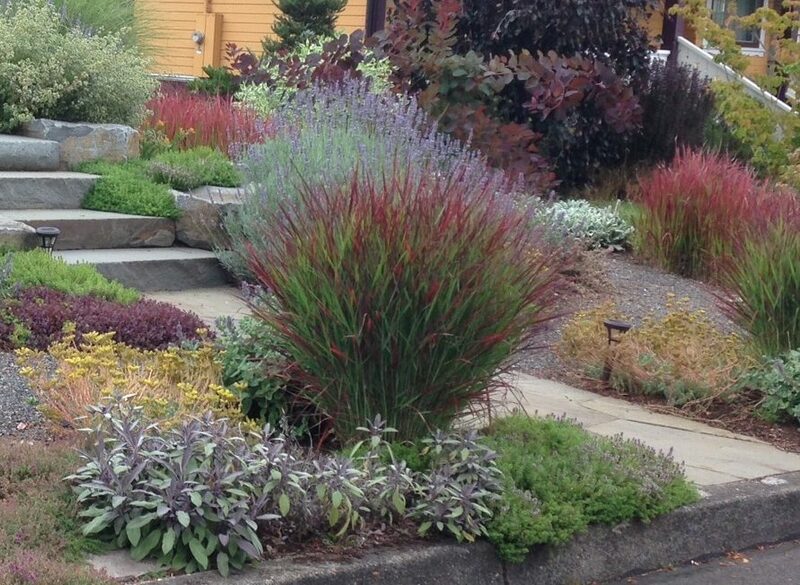 As a Portland landscape designer I have many clients who want exciting winter color in their landscapes. 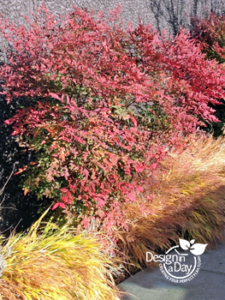 When new clients fill in their landscape preference survey they often circle the option for burgundy foliage and add little hearts! 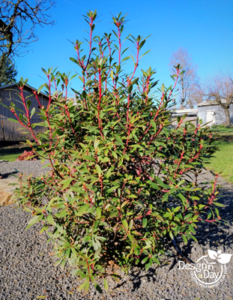 Sadly most burgundy leafed plants are not cold hardy enough here in the Pacific Northwest to look picture perfect in winter. 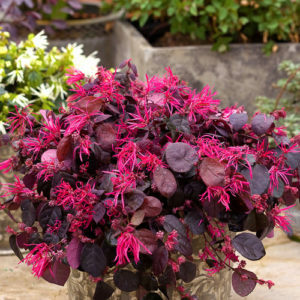 My favorite choice for dark red or eggplant purple foliage is called Loropetalum chinense var. rubrum or Red Chinese Loropetalum. Plain Chinese Loropetalum has green foliage and white flowers. I love the Red Chinese Loropetalum. 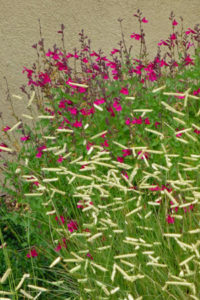 It has amazing thick hot pink fringe flowers in early spring. 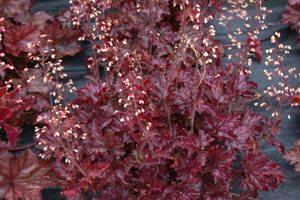 The spring foliage emerges burgundy red or dark to medium red pink depending on the variety. Other varieties are dark red to an eggplant purple through the year. 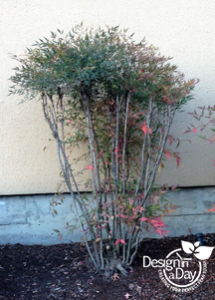 My NW Portland landscape design clients, Dave and Rhonda loved this plant. 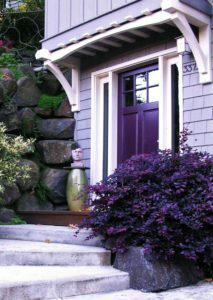 It provided a very attractive color echo of their eggplant front door and visually softened the adjacent concrete area. It looked good until January and then for several years the leaves burned and they didn’t grow back in until July!. The love was there but it took too long to recover for an entry focal point plant. Their plant got sun from 6am in the winter until 1 pm. They had good drainage and were careful and consistent with watering. Perversely, I have seen other plants simply glowing in February in the same exact siting. Can you tell I had a little trouble giving up on that one? I avoid 6 am winter sun for best outcome. So why bother with this plant? It is the wonderful purple red foliage color, the soft arching shape of the branches and the hot colored fringe flowers in spring. Its well worth it if you love purple foliage. If the plant gets cold east wind in winter, the leaves will burn (desiccate) and it may look terrible until May or June. Year round good looks is all about proper siting and a bit of luck. These two old varieties are still easy to find and are what I’m most familiar with: ‘Sizzling Pink’, which is also called ‘Burgundy’ (cold tolerant to 15 degrees), and ‘Pippa’s Red’ (hardy to 10 degrees). ‘Pippa’s Red’ is not as dark a red leaf as ‘Sizzling Pink’. I’m interested in ‘Hines Purpleleaf’, ‘Zhuzhou Fuchsia’ and ‘Jazz Hands’ but wasn’t able to find them to purchase. There are many new varieties but most were hybridized (designed) for the southern states and are not tested here in the Pacific NW. I love to drive around Portland and see them thriving. They saw it, bought it, and just happened to plant it in the right spot!! Whoever they are, they don’t even know its supposed to be a little tricky. I would be willing to try it in colder areas like Gresham but only where it is 100% protected from east wind. Even then, I’d consider it an experiment. A whole landscape of plant experiments is called gambling and is not typically the result we want in a landscape design. Most of my clients want a sure bet. I’m excited about these new plants for Portland gardens. Many of us are familiar with California Lilac and its blue flowers. Beloved by bees, including our endangered native bumble bees, it’s also a host plant for Swallow Tail butterflies. However, it has its problems in a home landscape. 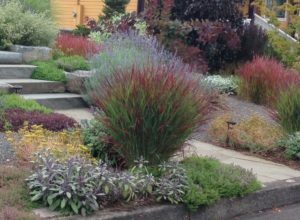 Many varieties are short lived because they receive summer irrigation along with your other plantings. They need infrequent or no summer water to be a long term plant. Most of all keeping them a manageable size is difficult for many gardeners. 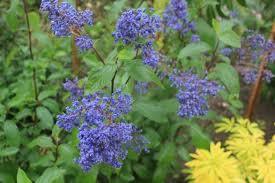 Ceanothus Griseus ‘Hearts Desire’ is different. 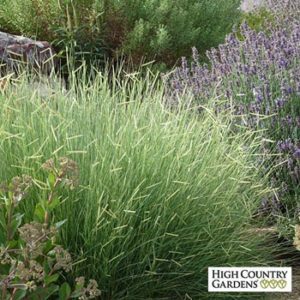 It can handle some summer irrigation and unlike all the other varieties of ground cover type California Lilac, it grows to only 4 inches tall and grows slowly to 24 inches wide. 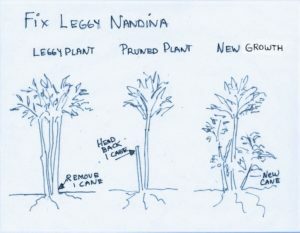 It is easy to tip prune so can be confined. 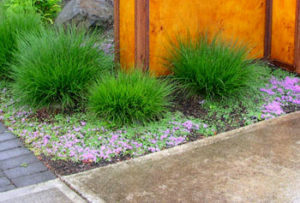 These new habits make it a very useful plant for smaller landscapes. 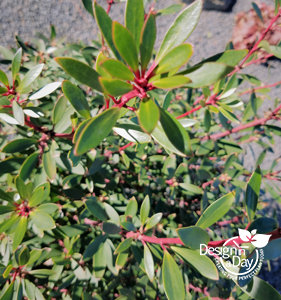 It can take a lot of dry so we can plant it in the xeriscape dry tolerant gardens that have no irrigation or it can receive some summer irrigation. I see this plant as a major improvement over old varieties like ‘Anchor Bay’ or ‘Points Rey’. Xera Plants is growing ‘Hearts Desire’ but expect other growers to jump on the plant wagon soon. I’d use ‘Hearts Desire’ under limbed up fir trees, on SW facing banks or in “hellstrips”. I will be trialing this new variety of California Lilac in my xeriscape garden. Manzanita is a shrub or large tree known for its colorful bark and picturesque windswept shapes on the northern California coast. Here in Portland it’s too wet or too cold for most Manzanitas. News flash! Some of the California Manzanita species have been hybridized (designed by humans) into cold hardy evergreen ground covers and shrubs. I love the leaves and the bark color and will be using these two specific varieties of Manzanita in my designs more frequently. My favorite is ‘St. Helena’ which grows to 24 inches, and can take irrigation if it must. For success with Manzanita don’t feed the soil with compost or fertilizer at all, not even when doing initial soil preparation. Work with the existing soil. It needs to be watered through its first summer and then little to no irrigation is best. This year (2015) my clients will be instructed to water it through its first winter as well since we are expecting a very dry winter but most years this would not be necessary. Note: hummingbirds love Manzanita flowers. Pacific Horticulture Society has an in depth article about Manzanita/Arctostaphlylos for the NW; by our revered plants man Paul Bonine. Callestemon or Bottle Brush is well known to Californians. They have many varieties with hot red flowers and they attract hummingbirds like crazy. Their loose needles have a tropical feel to them and they can look wild or messy depending on your point of view! While talking with Greg Shepard at Xera Plants, I got good news about the varieties of this plant that we can grow here in Portland. A few of these make very attractive tidy evergreen shrubs. 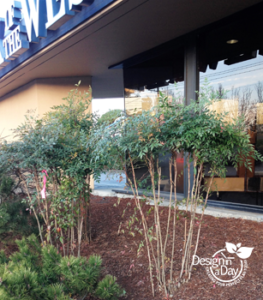 I’m always looking for soft textured evergreen shrubs with winter good looks that don’t get too big. Hummingbirds are attracted to all of the Bottle Brush plants but deer are not. Pretty great huh? 1. Callistemon Pityoides ‘Corvallis’. Yes found in Corvallis, Oregon the original plant withstood 20 years of cold and everything an Oregon winter can throw at a plant. It grows 5’ tall and 3’ wide in ten years. 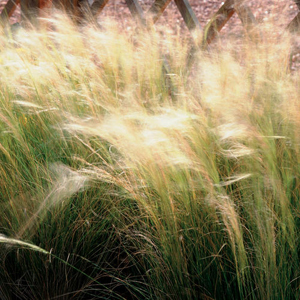 It can take regular water or can be trained into drought tolerance easily. 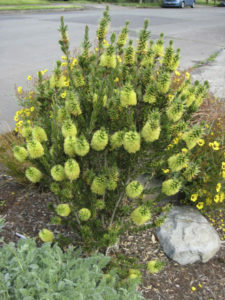 It flowers twice in a season with soft yellow bottle brush flowers that remind people of baby ducks. Deer usually leave it alone unless they are desperate. 2. 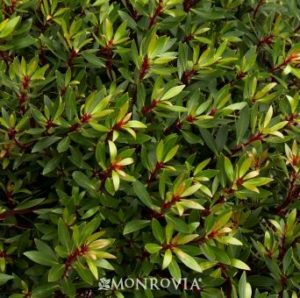 Callistemon viridiflorus ‘Xera Compact’ grows to 4 ½’ feet tall. It is VERY heavy blooming for 6 weeks. The flowers are chartreuse and yellow brushes 3 inches long, the leaves are deep green in summer and take on hints of red in winter.